1. The death of experts. Everybody thinks their opinion is just as good as an expert. Experts got us into Vietnam, Iraq, failed to predict Donald Trump. Nassim Nicholas Taleb cites just a few examples: “..with psychology studies replicating less than 40% of the time...dietary advice reversing after 30 years of fatphobia...macroeconomic analysis working worse than astrology….” We live in an increasingly skeptical society. The symbol of our expertise, the white coat, doesn’t have nearly the effect on Millennials as it did on their grandparents, who typically respect degrees and indicators of authority. I only hear from you when you want something: Imbalanced emotional checking account. We’ve done a very poor job of explaining WHY cats need semi-annual exams. I was recently talking about heartworm disease with a lifelong dog owner who told me that nobody had EVER explained to him why he was supposed to give heartworm preventative. In all those years...no education. Modern consumers, and especially Millennials, do not respond to “You need to give one of these pills to your dog every month” in the same way their parents and grandparents did. The fact that you are wearing a white coat and have an 8 yr degree might have mattered to their grandmother, but no longer. The reason the graph starts at zero at the very lower left is that every sane person knows that they have some limitations. As Dunning and Kruger themselves put it, "most people have no trouble identifying their inability to translate Slovenian proverbs, reconstruct a V-8 engine, or diagnose acute disseminated encephalomyelitis." The problems occur when pet parents, with only a passing knowledge of veterinary toxicology or feline infectious disease, think they know more than they do. Would it be fair to say that many pet owners (and breeders) fit into the spike on the left? They’ve been pet owners for years so they aren’t completely incompetent. “He/she knows enough to be dangerous” is a proverb that many of us have heard over the years. Easy access to information (i.e. 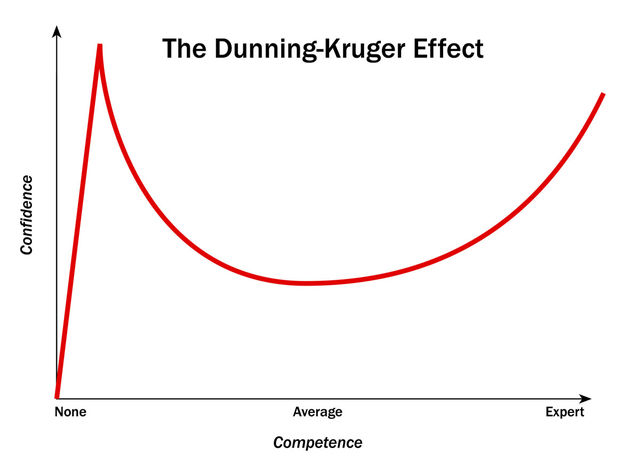 Google and Wikipedia) would tend to drive people to the right on the above curve, but the internet is no replacement for a veterinary education. “Dr. Google” is a quack, as I’ve written previously, but he’s a very popular quack. Any reader who remains skeptical about this need look no further than their own pets or the pets of their co-workers and employees. How many of them have every single one of their pets up-to-date on all your wellness care recommendations? For that matter, what about YOUR pets, doctor? Are you walking the talk? If you don’t act on your own recommendations, why would you expect your clients to? This is a serious problem in our profession that should open all of our eyes to the changing beliefs of our clients. The biggest factor of all? People are overwhelmed. Moms, who are often the primary pet caretakers in a household, are especially overwhelmed. “An errand like that is just not going to happen during the school week.” Busy Americans are barely keeping their heads above water through the combined effects of working more hours, school, homework, after-school clubs, Irish dancing, lacrosse, confirmation class…..the threshold for “getting my attention” is rising and an annual exam often doesn’t rise above that threshold. Bloody diarrhea does. A severe limp does, but a minor limp will probably go away on its own and, well, see my previous comments about being overwhelmed. In many emergency clinics, fully 50% of clients who walk through the door have no local veterinarian. We are headed toward a situation like that seen in human medicine where regular routine preventative care is gradually being replaced by reliance by on-demand urgent care: the ER vet is your doctor. To be successful in the future and thrive in an environment of growing competition, practitioners will have to get really good at converting client questions and impulses into appointments. Eliminate bottlenecks and “pain points” that your clients have if they want to get an appointment or refill. Capture every problem (i.e. red eye, limp, vomiting cat) that exists in the minds of their clients in order to be successful. If you make your clients work too hard to do business with you--like an email auto-response that says you will respond within 48 hours---they won’t. This starts with reducing your reliance on the telephone as the main (or only???) way clients can interact with you. This creates a powerful double-whammy: clients aren’t all that into you AND you’re tough to get hold of. The good news is that online and virtual consults, if done right, are fantastic ways to adapt to changing consumer requirements. It’s really not a question of if, it’s when. How are you preparing for the coming disruptions in our industry?